Mallaig, Ardgour & Ardnamurchan extends from Knoydart in the north, past Mallaig and Morar, to Moidart, Sunart and Ardgour. The southern part of the area includes Morvern, while to the west is the Ardnamurchan Peninsula. It also includes the Small Isles of Canna, Rum, Eigg and Muck. For accommodation in Mallaig, Ardgour & Ardnamurchan see the links in the "See and Stay" menu above. See the map below for an outline of the area and links to surrounding areas. 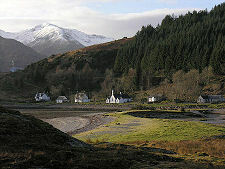 North of Mallaig is Loch Nevis, and beyond it is the Knoydart peninsula. Most of the few people who live in Knoydart the can be found in the tiny village of Inverie, which boasts Britain's most remote pub. 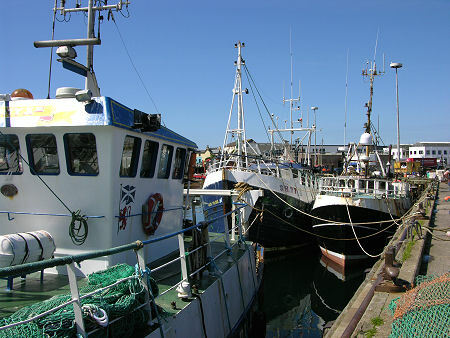 The most popular way to get there is by boat from Mallaig. 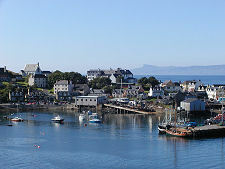 Mallaig is an important ferry terminal for Skye and the Small Isles of Canna, Rum, Eigg and Muck. Some of these can also be reached from Arisaig. It is also a relatively thriving fishing port, and when the fishing boats are in, the harbour is a hive of activity. The Mallaig Heritage Centre, next to the railway station, is a great place to find out more about the story of the town and its relationship with the sea. The Isle of Rum is the largest and most mountainous of the Small Isles and has been designated as a National Nature Reserve for over 50 years. For many, the highlight of a visit will be a tour of the magnificent, if slightly eccentric, Kinloch Castle. Between Mallaig and Arisaig is one of the most beguiling stretches of coastline in Scotland. 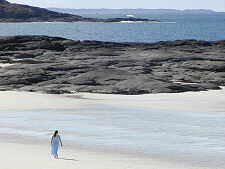 The Silver Sands of Morar offer amazing beaches combined with stunning views to Skye and the Small Isles. 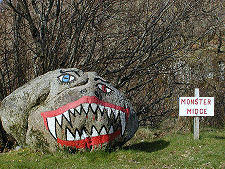 The focus of the area is the village of Morar, which lies near the head of Loch Morar, the deepest freshwater lake in Europe and reputedly the home of Morag, a close relative of Nessie. Recent improvement and rerouting of the A830 means you can now bypass this section of coast: if you do, then you have missed something well worth seeing. On Loch nan Uamh south of Arisaig is the Prince's Cairn, marking the point from which Bonnie Prince Charlie departed for France after the failure of the 1745 Jacobite uprising. Railway enthusiasts have the option of arriving in Mallaig on the Jacobite steam train which runs from Fort William in summer. This wonderfully scenic line crosses the impressive Glenfinnan Viaduct and provides great views down Loch Shiel. There is also an ordinary train service between Fort William and Mallaig on this extraordinary railway line. Half way between Fort William and Mallaig on the A830 lies Glenfinnan. It was here that Bonnie Prince Charlie raised his standard to mark the start of the Jacobite uprising in 1745 before marching south as far as Derby, and so very nearly changing the course of history (see our Historical Timeline). Today a display in the NTS Visitor Centre at Glenfinnan recounts the story and the Glenfinnan Monument offers excellent views over this once troubled landscape. Glenfinnan is also home to the Church of St Mary & St Finnan and to the beautifully preserved Glenfinnan Station with its museum and other facilities. At Lochailort the A830 meets the A861 and opens up the remainder of this large area, which stretches as far south as Lochaline and its short ferry crossing to Mull; as far west as the wild and windswept Ardnamurchan Point; and as far east as Ardgour and the Corran Ferry across Loch Linnhe to the main road south from Fort William. Lochaline is also home to the remarkable Carved Stones of Kiel, at Kiel Church, while another single track road leads the 12 miles up the coast of Morvern to Drimnin. Heading south from Lochailort along the A861 you pass Kinlochmoidart, home to the Seven Men of Moidart, the remains of seven beech trees planted in memory of Bonnie Prince Charlie's companions. Nearby is St Finan's Episcopal Church. Carrying on south brings you to the scattered settlement of Acharacle, complete with Acharacle Parish Church. 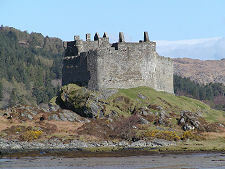 Two miles from Acharacle on the shore of Loch Moidart is the ruin of Castle Tioram. You can find out more about the village of Kilchoan on one of our feature pages covering the Ardnamurchan area. Others cover Ardnamurchan Point itself, with its lighthouse and visitor centre, and the wonderful beaches at Sanna. One of the most important villages in the eastern part of the area is Strontian, close to the point at which the road up from the Mull ferry meets that running out to Ardnamurchan. On the remote Morvern coast overlooking Loch Linnhe is the small settlement of Kingairloch. This is an area characterised by beautifully wild countryside, by tortuous coastlines, by remote hamlets, and by more miles of single track road than you are likely these days to find anywhere else in mainland Scotland. Driving Tours: Parts of the north of the area are included in our Fort William & Skye Driving Tour, while much of the south is included in our Fort William & Ardnamurchan Driving Tour.